Yep, there's heaps of boards to chose from but the right one is out there. Somewhere. Breaking down what you need to know and what you need to ask when splurging cash on a new stick. Boards are built specifically to suit riders’ skill levels and therefore it is important to be realistic about how good you are. Definition: From cherry popping to linking turns and stopping with control. - When buying, go basic freestyle for the fun and ease of ride. - Avoid super-trick, aggressive pro models. As the name suggests, they are built for those who posses the skills already. Definition: You have the basics dialled, you like tricking out on the piste and you are getting to grips with hits. - Buy a more responsive all-mountain or freestyle board to take full advantage of the terrain at your disposal. - You are progressing so don’t hinder yourself with a board below your riding level. Definition: Black belt in trickery and master of all terrains. - Buy high-end and push the board as hard as it pushes you. - Pro-model: ride a pro’s board whose style you admire and who is of a similar build – that is until you get your own. Nicolas Müller. A sterling example of an all-mountain rider. Photo: Cole Barash. Boards, by design, are specific to terrains. Not that you won’t be able to ride them where you like, but they slide better where they are built for. - For the rider who considers the entire mountain as their playground, from pow to groomers and park to backcountry booters. - Shape – Directional (ie longer nose and shorter tail) or directional twin (twin shape but directional flex). - Flex – Stiffer than a freestyle board. Flex can be shaped to deliver a graduated flex pattern with a more responsive stiffer tail and a softer nose. - Stance – The stance favours the tail more than the nose, or in shop terms, ‘set back’. - Length – Longer than what one would choose for freestyling. SHOP FLOOR TEST: An all-mountain board should come up somewhere around your nose, and can be even longer if it’s purely for gunning powder days. (always check weight range). 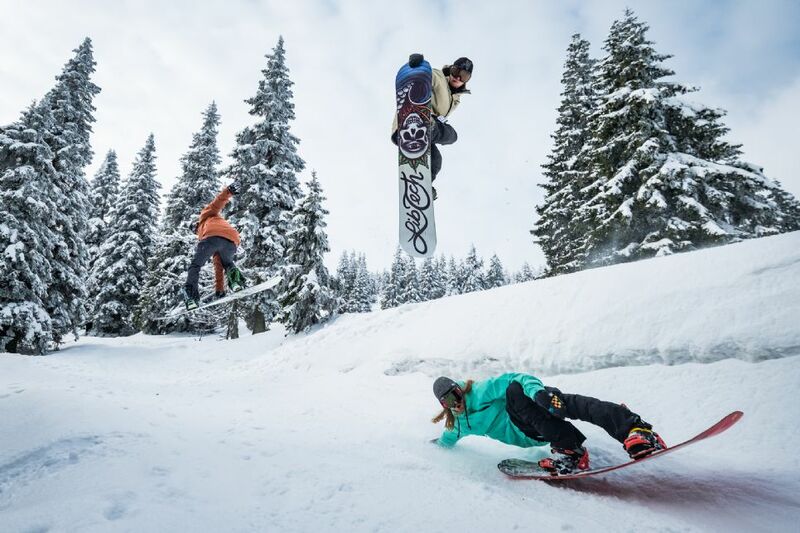 - Boards are designed to jib, slide rails, ride the pipe and tackle all things that send a snowboarder skyward. - Shape – Twin tip. Twins can have either a directional or twin flex (true twin) but they are both built to land tricks. Most in this category will be true twins. - Flex – Softer than an all-mountain / freeride board. - Stance – Centred but with the option of setting it back for pow riding and landings. - Length – Shorter than for freeride and all-mountain boards. - Such boards are aimed at those who ride forwards 9 times out of 10, and have a desire for speed and powder. - Shape – Directional. Longer nose and shorter, often tapered, tail. Designed to get the nose lifting up in deep powder. - Flex: Softer nose and stiffer tail to enter turns easier and boot you out of them. Generally stiffer to deal with high speed aggression but some pow-specific models are more soft and playful. - Length: Generally longer than all-mountain boards and certainly longer than those for tech freestyle, with the exception of some powder-only models like Burton’s Fish – designed to be ridden shorter than your regular all-mountain board. - There is an old axiom that the right board comes somewhere between the chin and the end of your nose. While this is true to some extent it is an oversimplification as board length is also dependent on a rider’s weight and their chosen riding style (see terrain). - Choose your board length by looking at the weight range of individual models. This takes into account intended use, flex, shape and length to keep you afloat in the pow and not pearling out at speed. - For reference, these are the weight ranges for Burton’s Custom, which is considered one of the best selling, all-round boards on the market. However, remember that all boards are different, so check the specs of each individual board when you are buying. - The measurement in centimetres or millimetres at the narrowest point of a board’s waist. - The deciding factor when choosing the ideal board width is the size of a rider’s feet. - If your board is too narrow, your performance will be hindered by heel and toe drag. Too wide and you will lose responsiveness. SHOP FLOOR TEST: Don a pair of snowboard boots in the shop and screw a pair of bindings to the board at your preferred riding width and angles. If your heels and toes hang over the board’s edge by more than a couple of centimetres, you need to go wider, while if the board is wider than your boots you need to slim down. - Ideal for beginners, less aggressive and lighter riders. Perfect for jibbing. - A stiff flex makes the board more stable at high speed, gives better edge hold and more responsive turns. It is harder work to get such boards to turn, though, so beginners should steer clear. More common for higher-end boards aimed at aggressive riders needing response, pop and edge hold. - Graduated stiffness going from a softer nose to a stiffer tail. - Twin flex, by definition, means that the flex in the tail is equal to that in the nose. Perfect for freestyling if you’re riding switch a bunch. - This is the flex of the board from edge to edge and defines how a board will hold an edge. - Longitudinal flex is responsiveness of the core from tip to tail. Effective edge – The length of edge in contact with the snow. A longer effective edge delivers better hold, but impairs responsiveness on turns. Inserts – 4×4 is the most common insert pattern and all bindings come with accommodating plates, even Burton’s (though you may have to ask your store). Burton boards have their signature 3D pattern as well as the new E.S.T. slider system on some models which offers limitless stance options. Sidecut – Measured as the radius of an imaginary circle drawn from its curve. A deeper sidecut (small radius) will mean the board will make tight, short radius turns, but it may feel twitchy straightlining. A shallow sidecut (large radius) won’t be so good at turning quickly, but will be perfect for long, sweeping turns on big mountain faces. Many companies’ boards blend sidecut radii to give the optimum edge hold and turning both regular and switch. Camber – Camber is the arc of the board middle when lying on its base. The more camber, the more lively the board, which will mean that you have to be an experienced more aggressive rider. Reverse camber – AKA Banana, Rocker, Chilly Dog etc. The base of the board, or parts of it, are pre-curved in the opposite way from regular camber. Makes the board funner to ride in many conditions, though edge hold and pop can suffer. Core – Vertically laminated strips of wood with rebounding properties and good memory. Different woods can be combined for the optimum strength, weight and pop, and some use certain wood and grains to better direct energy to the board’s edges. Rental and entry-level boards can have injected foam cores while some top-end boards use honeycomb to save weight. Carbon, Kevlar – Strips of carbon fibre can be laid on the core to add pop and response. This is generally found in more expensive boards. Kevlar may be in there too to add strength. Glass – The fibreglass surrounding the core affects the board’s flex. Biax (two layers) is usually softer flexing torsionally and makes for an easier ride, though with compromised edge hold associated with torsionally stiff boards. Triax (three layers) makes the board torsionally stiffer and helps the board carve better at speed, but will make the board harder to handle. Quadrax glass is also available. Glass can either have the resin poured on, or pre-impregnated (pre-preg) that is more expensive but gives more even distribution and flex. Base – There are two types of base, extruded and sintered. The cheaper and less gouge resistant extruded base doesn’t absorb wax as well as the sintered but is easier to fix. Sintered bases are tougher and absorb more wax so run quicker but repairing them can be harder. Topsheet – This is the protective layer with the graphics but can also have performance-related dampening properties. Elan has a production method that eliminates the topsheet by printing graphics into the glass, thus saving weight. Sidewalls – Most are made of ABS plastic, some of P-Tex, and protect the core on sandwich construction boards from knocks. They also can have dampening properties, like with the Ride Slimwalls. Setting up your board is a process of trial and error. However, once you’ve found the most comfortable and rewarding stance, you will try and replicate it on every board you ride. For newbies, deciding which foot goes forward is the starting point of riding. Ask the kind shop assistant to push you from behind. The foot that you put forward to stop yourself from ploughing headlong into the outwear section of the shop is the foot that you will lead with. Alternatively think back to when you last slid on ice: again, the first foot that you put forward is your leader. The width of your stance is a question of comfort and, let’s face it, style. Wider thugged-out stances deliver a lower centre of gravity that is good for landing tricks, however go too wide and your turning might not be at its most efficient. Stand on a board and see what feels comfortable. Your insteps should be roughly a shoulder-width apart. Again this is a question of comfort and also what works best for your chosen riding style. Your front foot should be set at a positive angle while your back foot can either be positive or negative; the latter is called ‘duck’ stance. If you just ride forwards, try having like +3 to +6 on the back and +24 to +27 for the front. If you like a bit of everything, go for duck stance so your switch riding doesn’t feel odd: try –3 to –9 on the back, +18 to +21 on the front. And if you just rock the park, thug it out with something like +15, –15. Directional shape and flex boards are designed to be ridden with the bindings set back from the centre of the board to perform as they should. If you’re riding powder, it also helps if you have set back your bindings. Centring your bindings means switch riding is easier, and is the way to go with twin-tip boards.